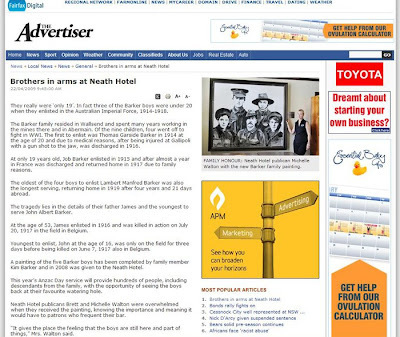 Anzac Day 2009 - my Artwork published! laketrees: Anzac Day 2009 - my Artwork published! 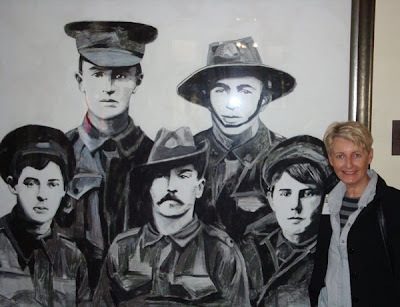 Anzac Day 2009 - my Artwork published! Lambert Barker's son Jack Barker with the work "The Last Train Home"
Last year I donated one of my works "The Last Train Home". thanks Mum as I certainly wouldn't have been aware of the article otherwise!!! yesterday supposed have dinner with them but total got 13 ppls so its not a good number so we not go. hows weather there? here is very hot!! I'm here Kim! Wakey wakey!!! I shld be saying wakey wakey to myself eh Kim? LOL! ... but why is everyone in black and white while you are in color?? I'm running behind this week...it's already Tuesday and I've got a million things to do ..eek!!! now I'll have to see what the photo looks like in grayscale..haa!! have a great Tuesday mate!! Many congrats on this awesomeness Kim, well deserved. Kim, that is so awesome! Justly deserved recognition for one fine portrait. The size is amazing. It is neat seeing you beside it, it gives the painting even more meaning. 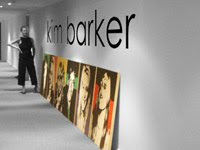 Bravo for you Kim, you are such a great artist. Your design and the draftsmanship are superb. This is great, you were also recognized when they gave recognition to this art. The painting is truly amazing. Congrats Kim - you really deserve this - you know I'm a great fan of your work!